The first thing to note here is that he's talking about a very very tiny fraction of restaurants... the ones that are in contention for "Best Restaurant in the World." In fact, I'm not aware of any restaurant in Boston where you are given no options besides being at the mercy of the chef for hours on end. Certainly many offer multi-course tasting menus, some of which are "chef's whim" where you are given no choices other than perhaps a dietary restriction... but you are not required to choose these types tasting menus to dine at a high end restaurant in Boston. I understand this is different in New York and Chicago, and perhaps other cities... but I think it's important to note that this is not a trend sweeping the nation. Tasting menus are certainly very popular these days, and I think there certainly some pressure... societal and from the restaurants themselves... to order them instead of a la carte... but does it rise to the level of tyranny? Hard to see how it does since it's completely voluntary. If I ask Tony Maws to feed me a vegetarian meal of his design (as we have done) it seems odd to then lament the lack of control. So then it comes down to the complaint that if I want to eat at one of the ten best restaurants in the world then I am not going to have many(some, but not all, will do vegetarian) choices. You also have to be ready to commit your entire evening and be ready to pay $500 a person. That's an extremely large sum of money for a meal... something I could never even consider except a very special occasion... but then isn't that exactly why it should last for hours and consist of a bewildering array of courses? 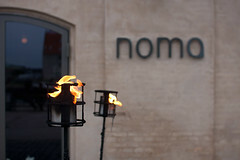 If I've been saving for years to fly to Copenhagen for a dinner at Noma... shouldn't it be an event? Not a zippy hour long meal so we can make a 7:15 movie? I mean, if I ever eat at Noma it's not like I'll be coming back... and I'm going to be expecting to have the best meal of my life... which sounds exactly like what they are trying to provide... and bizarrely, exactly what Kummer is complaining about. It's certainly reasonable to say that spending several thousand dollars for a single meal is absurd, but he doesn't explicitly make that argument... and it comes across more as the lamentations of a jaded food writer to me. Someone who has the opportunity to eat at all these amazing places and who doesn't really appreciate it. At this point the best thing that can be said about the article is that it has at least engendered interesting discussions elsewhere.